No, cider holds a special place in my heart, and so, when David Carter of Tart and 40 Winks fame invited me and Naomi along to the launch of a rather stylish, fruity cider-themed event, I couldn’t possibly say no. But before we get to the cider, something a bit more traditional! I had Afternoon Tea at Brown’s Hotel with my dear mum! Oh, I do love an Afternoon Tea, and it’s particularly delicious at Brown’s! My favourite bit is the sandwiches, my mum’s the scones, clotted cream and jam. What about you? After I’d eaten my bodyweight in sarnies and cakes, and drunk a couple of litres of tea, I swooped off to Vintage Secret Towers to get changed for the party. Suitably attired, Naomi and I then headed off to Fitrovia, to 33 Fitzroy Square, to be precise. 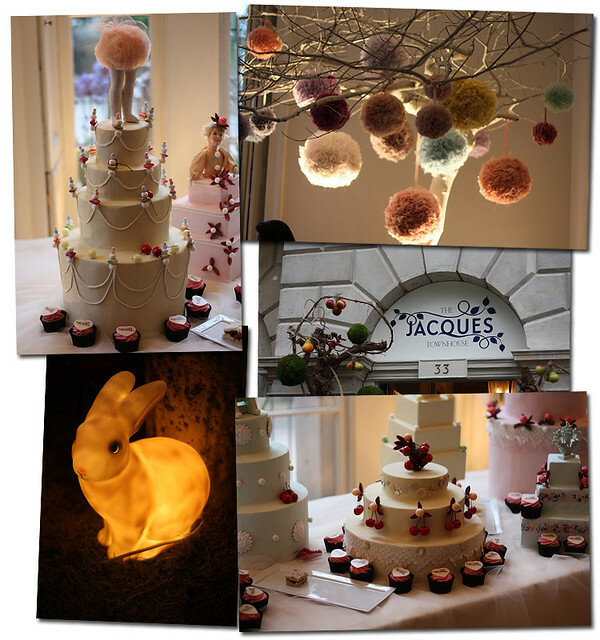 The Jacques Townhouse is a splendidly stylish venue, designed top to bottom by Mr Carter, filled with delicious treats and Dragon Den favourite Vintage Patisserie cupcakes, Benefit eyelashes, dressing up clothes and… Cider! The cider itself is something I have always seen in the supermarket but never tried – a fruity, fizzy draught, in two flavours, Fruits Des Bois and Orchard Fruits. I loved the Orchard Fruits variety! The idea behind the event was to introduce girls to the delights of Jacques, by getting David in to design this pop-up townhouse and hosting mini-parties several times an evening for a couple of weeks. But how about a peek inside the house? The intricate cakes were just for show, but Angel’s cupcakes and the assorted canapes went down a treat. Everywhere you looked, there was something to see, from frothy pompoms, to vintage suitcases and hatboxes, old photos and ephemera, plus a secret ‘garden’ filled with glowing bunnies, plush cushions and vintage tea cups. I wore my well-loved but still fabulous Whirling Turban outfit (I wish I could get another! ), while Naomi wore a smashing early 60s cotton, floor-length evening gown, which could have been made for her, it fitted so well. 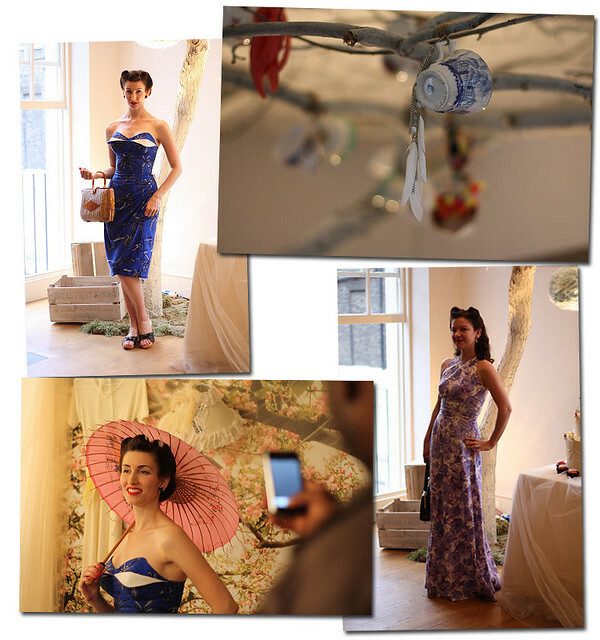 There were some truly gorgeous outfits on display as well, which were all captured by the official photographer. We of course, couldn’t resist having a go in front of the camera! Here we are, posing away, with a snap of the gal in my favourite outfit. It’s a playsuit/overall with a very 30s look, and the girl (I think her name was Adele…) looked amazing in it. If you’re curious for more, have a browse on the Jacques Facebook page for more. All in all it was a splendid night, and lovely to see some famous faces up close, including Sophie Ellis Bextor (incredibly stylish but so thin), Donna Air (also very thin) and a girl from the Sugababes. David did a wonderful job with the decor, and by all accounts the 10+ day event has been a great success. It’s certainly made me very amenable to Jacques cider! The official events were slightly different, in that each girl received two drinks and a cake, and was let loose in the house for an hour and a half. If any attendees or girls who unfortunately missed out on the free spaces are interested in something similar, hosted by yours truly, Naomi and of course, Mr David Carter, then why not come along to Tart! You get the dressing up, the makeup, unlimited food, cake and drink, plus four glorious hours of fun! You can get in touch with David for more info… and gosh do I have some wonderful photos to post very soon, to tempt you all further! Must dash, love to each and every one of you! This made me swoon – we must have been separated at birth. First gin, then cider (yum) and afternoon tea. Not to mention vintage! I haven't been to Browns yet but have done a fair few other afternoon teas in London. I wrote a post about The Milestone recently, which was really fantastic and in a gorgeous setting. This is all so lovely! You had me at afternoon tea and cider. (quite possibly my two favourite things) Browns looks gorgeous – I always wanted to go there when I lived in London but never had the chance! And that blue dress is positively stunning, as is your hair. You are always the picture of perfection! That house looks like a dream come true-I particularly love the glowing bunny and the cake decorated with tiny cherries. Your dress is absolutely stunning and I love the outfits the other girls are wearing too! In fact all these photos are so pretty I could look at them all day. Very nice and posh, Fleur. Fleur, you are gorgeous. I really love these photos! I love love love all things vintage. It's like resurrecting a whole city. I luv the glowing bunnies,i want one! 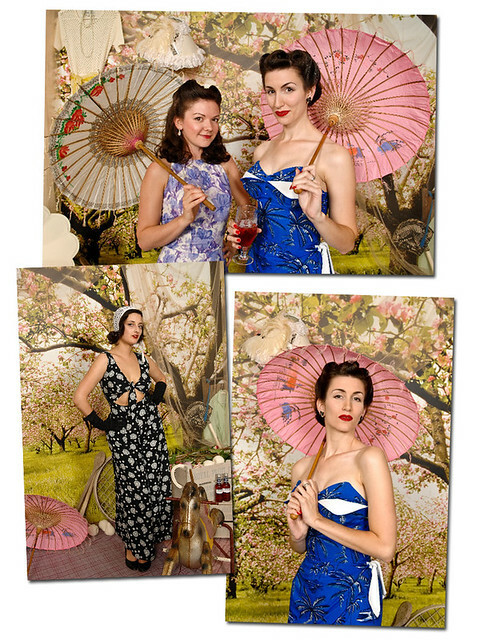 Naomi & yourself look stunning,that blue is definitely your colour & the parasol is so pretty. How's Inigo going?All better now? I'm supposed to be studying for law midterms but I just had to comment. 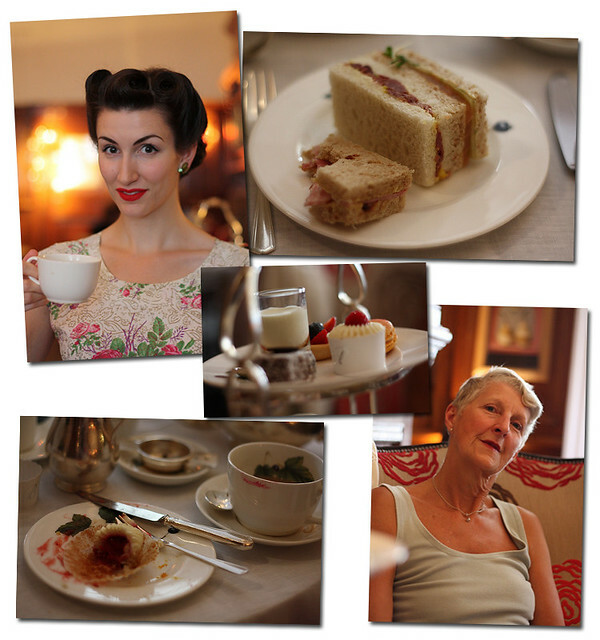 Your photo layout is just divine and it's convinced me that my Big Splurge for my summer hols will be tea at Brown's! I entered a contest to win a walk-on role on the most retro-licious TV show ever: MAD MEN! But I need your votes to help me win, so please visit my blog or go to http://madmencastingcall.amctv.com/browse/detail/EZ3MBH and vote for me! You had a great afternoon and to spend part of it with your mother and then off to a party which was beautifully decorated and I love those cupcakes and all of the decor and you girls look so GLAMAROUS there's nothing like getting all GLAMED UP! My god! You're astonishing on these photos!!! Hello from California! I sincerely adore your blog and photos.I love all things vintage as well and while reading I noticed one of my good friends Adele Mildred!! She is truly a doll and I'm so happy to see she is having fun with new beautiful ladies as yourself in England! Welcome to what used to be called Diary of a Vintage Girl, my blog since 2008. It covers everything from vintage & modern fashion, food & drink, beauty, events & lifestyle. My archives go back a long old way. Enjoy!